I felt a little guilty for being in Game Mode these past few weeks so I got my kids a game of their own! 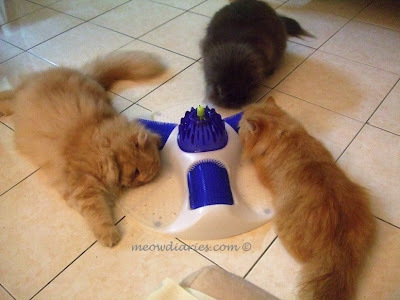 It's been a while since we bought them a new toy and cats too need to have their own fun and games right? While Master is happily in her own little Casino Online world, you guys can have some fun as well okay? After much discussion, B and I decided on the new Deluxe Activity Centre, which is basically a grooming toy. You add in a little catnip into the provided slots to naturally entice your cat. Known for its behavioural effects on cats, the catnip will drive your cat "crazy" and you may see them purr and roll over in glee, pawing at the toy; chewing and biting the brushes where the delicious catnip is hidden from sight. In doing so, your cats will enjoy the fun they find in the catnip whilst getting their fur brushed and groomed at the same time! Pretty cool right? 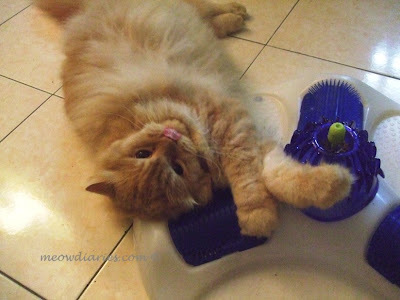 It's a toy and a groomer all in one! Benji was the most excited and could not wait to get his paws on the new toy. He kept on getting in the way of me assembling it! I'm happy to see that my kitties obviously love their new toy; it was a hilarious seeing them gone wild trying to find the cat nip! Thanks to this new fun and entertaining cat toy, I won't feel so guilty when I check into my casino games. The one I'm playing has a whole new range of roulette tables; come on lucky number 29! today it took ages to load the page.. i wonder why..
wuaaahhh bestnya!!!!!!! Pheebs, Benji and chubbs all enjoying their new toy!! the things people come up with are certainly amazing to see.. especially for people without any pets. LOL! Yay! A New toy for the cuties! Penting tu seminit, lucky not sesaat, lagi sakit hati! Meow! LOL Marvic!!! Eh marvic, I gave u some awards at Mariuca, blm sempat hantar message! Pls come by to accept ur awards sweetie! kitties all look so happy playing with. MAster plays game, now meow2 also can play game. Oh yeke less than rm50 marzie?? Wuaahh.. I tot it would be more expense..
something like rm79.90 or something like that! LOL! omg. 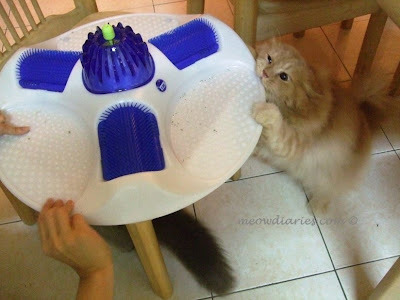 cats also have such complicated toys??!! i want to be a house cat in my next life! It´s my day off and I´m online doing drops too. Just saw yours. Great toy, never saw one of those. I´m sure the kids will have loads of fun with it. Two days ago, I brought home another furfriend I found on the street, a little furgirl that was abandoned. Couldn´t resist her, she´s so sweet. I haven´t posted about it but I will, soon. ah she seems to like it. she is so sweet and fluffy! Recent blog post: Friday Fill-Ins: Casino games, Envy, Movie! 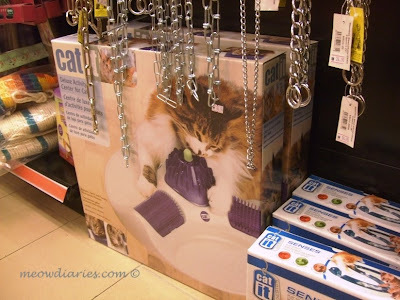 This would really be an amazing toy for the kitties. Luckily my cats kat rumah tak reti-reti ngan menda hip hop nii semua..